UNITED NATIONS, January 19 -- As the UN Security Council voted to authorize 3500 more peacekeepers for Haiti, including 1500 more police, Secretary General Ban Ki-moon called on member states to step forward with offers of troops. 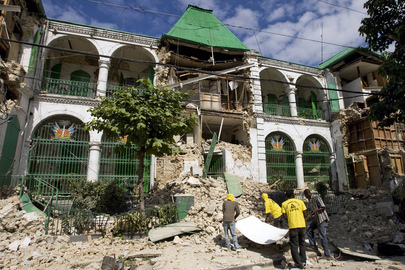 Inner City Press asked about the Dominican Republic's offer of a battalion, said to number 800, and whether Ban and the UN think that countries should be less stringent with their immigration restrictions after the Haitian earthquake. Mr. Ban replied by praising the Dominican Republic for its troop offer -- which some see as simply blue helmeting a border guarding force -- and for its help with the humanitarian effort. He is aware, he said, of the Dominican Republic's attempt to accommodate Haitians within the Republic's "rules and regulations." Inner City Press asked Ban about reports that the UN had run out of fuel for its trucks to deliver aid. Top humanitarian John Holmes passed a note to Ban Ki-moon, who read out that last night 10,000 gallons of fuels had arrived. When Holmes himself took to the custom made podium brought out for Ban Ki-moon, Inner City Press asked him about a reported complaint by Armenia's Mission to the UN, that they had offered a rescue team last Thursday but were never told of any UN acceptance or decision. Holmes replied that he was unaware, but that there are always issues of matching needs with offers. But from member states? Inner City Press, which reported exclusively Monday evening about what UN sources said was a helicopter crash in Haiti, asked chief Peacekeeper Alain Leroy for an update. I've seen those reports, he said, but I have no new information this morning. He said to ask Edmond Mulet, who will be appearing later on Tuesday by video link from Haiti. The Ambassador of China Zhang Yesui, this month's Security Council president, came out at announced the Council's vote. While usually he leaves the stakeout without taking any questions -- on Monday he walked away as Inner City Press asked about the attacks in Afghanistan -- this time he called on Xinhua, and offered a long answer on camera, in Chinese. 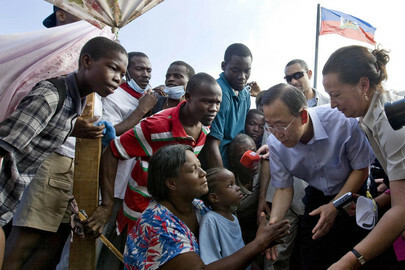 It concerned the UN's role in responding to Haiti. Asked if China would offer any more troops -- its 125 member contingent is, as Inner City Press has reported, a "riot squad" that when rotated has flown back to Xinjiang Uighur Autonomous Region -- Zhang Yesui said it would be taken under advisement. The last speaker at the stakeout was U.S. Deputy Ambassador Alejandro Wolff, who came prepared with an answer to Inner City Press' question of Monday, whether the $100 million of aid announced by President Barack Obama would be part of the UN's flash appeal. No, Ambassador Wolff said, the $100 million is "bilateral." But he said that the US will be contributing generously to the UN's flash appeal, in the coming days. We'll see. Footnote: because the UN and even Security Council has become all Haiti, all the time for now, Inner City Press asked the U.S.'s Alejandro Wolff about reports of bombing in Darfur, requests to protect civilians, and Chad's statement it does not want the mandate of the Darfur related MINURCAT peacekeeping mission renewed. Wolff said the U.S. is concerned and is seeking more information. Inner City Press has asked the UN too, and hopes to be able to write more on this topic shortly. Watch this site. Inner City Press: Mr. Secretary-General, the Dominican Republic has offered a battalion – it has been said publicly – they’ve also said that they are very concerned about immigration and people crossing the border. Does the UN have anything to say whether countries should loosen their immigration restrictions on Haitians, or otherwise, after this crisis? And also, does the UN still have gas to run its trucks? There was a report in USA Today that the UN was running out of gas for its food distribution trucks. SG Ban Ki-moon: From the beginning of this crisis, the Dominican Republic Government has been providing very generously and swiftly all possible assistance to their neighbouring country, Haiti, and we are very much grateful to them. I am also aware of the Dominican Republic’s intention to dispatch troops there - that is also welcome. For the immigration issues, I am also aware that the Dominican Republic Government is trying to accommodate as many as possible, those people within the existing rules and regulations of their country, but they have been very generous. Of course, this fuel is quite limited in Haiti. Ten thousand gallons of fuel, I think, arrived last night from the Dominican Republic. That will help more, as we continue our operations.